Starting GPS Co-ordinates: N51 15' 12.42" W000 41' 47.14"
Finishing GPS Co-ordinates: N51 14' 43.46" W000 40' 38.02"
Note: This lane appears to have undergone clearance work and an overhaul since we last drove it. See the picture, here, taken from exactly the same spot as our picture (right). This lane of two halves begins in the hamlet of Wyke, just after the traffic lights on the junction between the A324 and the A323. At it's northern end, the lane is really quite narrow. The earthen surface at this end is pretty rutted (see picture, right), and once your tyres inevitably find themselves following the ruts there is no easy way out, making it impossible to avoid the many trees and bushes that line the route. Superficial damage to your paintwork is therefore likely. 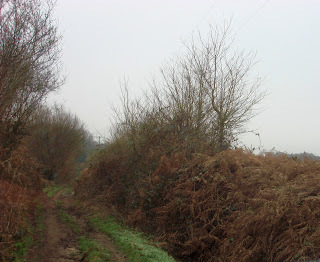 The lane heads downhill around the back of a particularly ugly housing estate (way to spoil the countryside, dude), jinks south-east and follows a flat field boundary until eventually meeting Wyke Lane. This would be a much better place to start the lane, as from this point on the lane enters woodland, the ruts all but disappear and the foliage yields its grasp. Shorty after passing underneath a line of pylons, the surface changes to leaf mould which could be slippery when very wet, and the lane plunges into Catherine Frith Copse, starting gently downhill once again. On emerging back into open air, the lane turns to the east and follows a succession of field boundaries on a dirt surface until reaching it's gated junction with Westwood Lane. The second half of this lane is far more pleasant to drive than the first, and there is not much to see in the surrounding area, and therefore only scores a 2. This appears to be Follyhatch Lane: see http://www.geograph.org.uk/photo/1878929 and the 1920 6" map. It is indeed Follyhatch Lane. Thanks a ton for your help, I've updated the page!